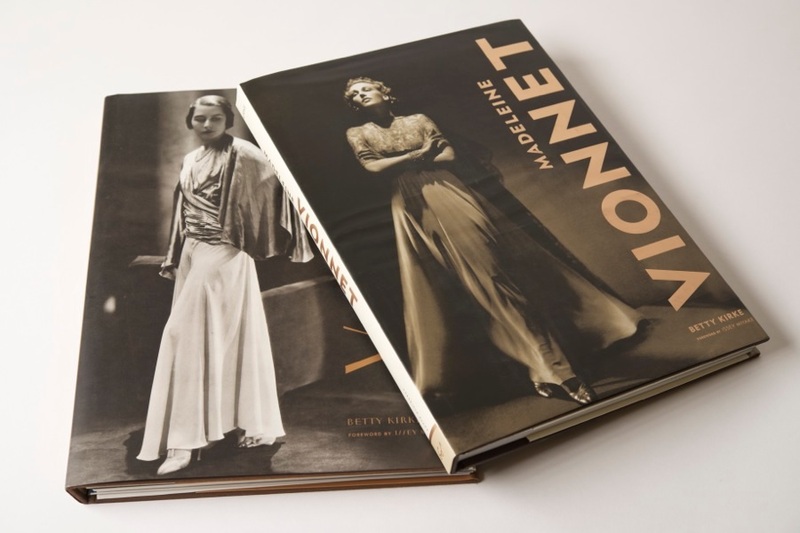 With Prom season upon us, I’d like to post about a quick and easy but awesomely elegant gown to make from the genius of history’s famous designer Madeleine Vionnet. I love finding patterns that look the opposite of the amount of difficulty they present in the making process. If you’ve got a handful of hours, a super fancy buckle, and several yards of nice fabric with a formal event to attend, then this pattern could be for you! It’s the epitome of 1930’s glamour yet passes as fully modern. NOTIONS: Just thread and bias tape were the only notions I needed, besides the buckle. TIME TO COMPLETE: Only four hours! It was made on the evening of December 4, 2015, with about an hour more to place and sew on the buckle and finish the ties. THE INSIDES: All bias bound, except for the bottom hem which is on the bias and left raw with some fray check to keep the edge in check. TOTAL COST: the crepe-back satin was a Hancock Fabrics “Beautiful Fine Fabric” special – I bought it on sale for about $20. The buckle was bought at an antique/vintage re-sale shop for about $35. 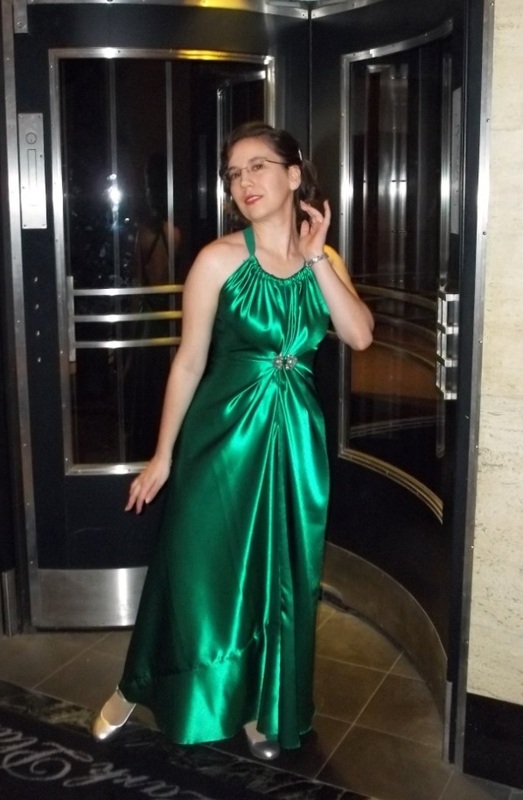 This Vionnet gown makes me feel so amazing and elegant, like some movie star of the silver screen of olden times. Words to describe it would just seem tacky. The bias moving with you and flowing around you is a lovely feeling. Every lady deserves a good bias dress. I have heard some women mention that only certain figures can pull off a bias dress, but I disagree. First, women of the 1930’s were generally slender (it was the Depression) but they did wear foundational undergarments which helped with shaping. Shaping underneath or not, nevertheless when the bias is cut well with a good design it will do a body good! 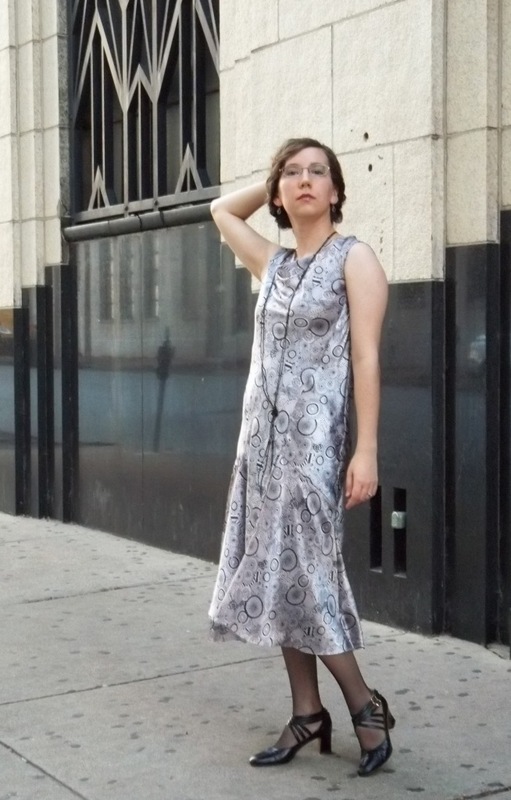 After all, I have never yet found any RTW (ready-to-wear) frock which accomplishes the bias correctly like when you find a really good pattern and make it yourself. Although I absolutely love it, I cannot figure out an anomaly about this gown. The original dress which is on display online at the MET museum lists this design of evening gown as dating to 1936-1937. 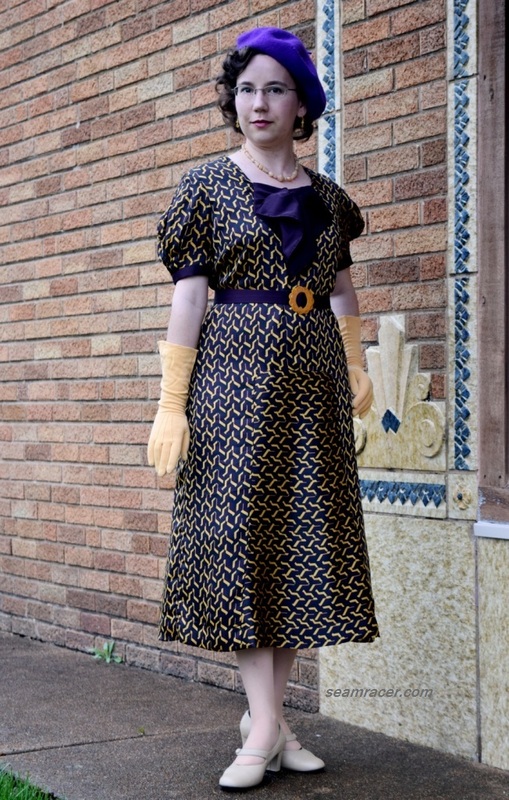 However, the Betty Kirke book from which the pattern came from lists this dress as 1935. Alright – who’s right? Which year is this dress? Also, between knowing what I know about fashion history and what I’ve read, the gown is both behind its time and ahead at the same moment. The early 1930’s had a fad for the “half-naked-from-the-waist-up” styles of evening gown, then by about 1933 the styles became slightly more decent by following the fad for higher necks and shoulders covered with ruffles or poufy sleeves (discussed here at “Witness2Fashion” under “The Letty Lynton Dress” and “Very Bare Backs, 1930’s”, also see my past-made mid-30’s evening gown). 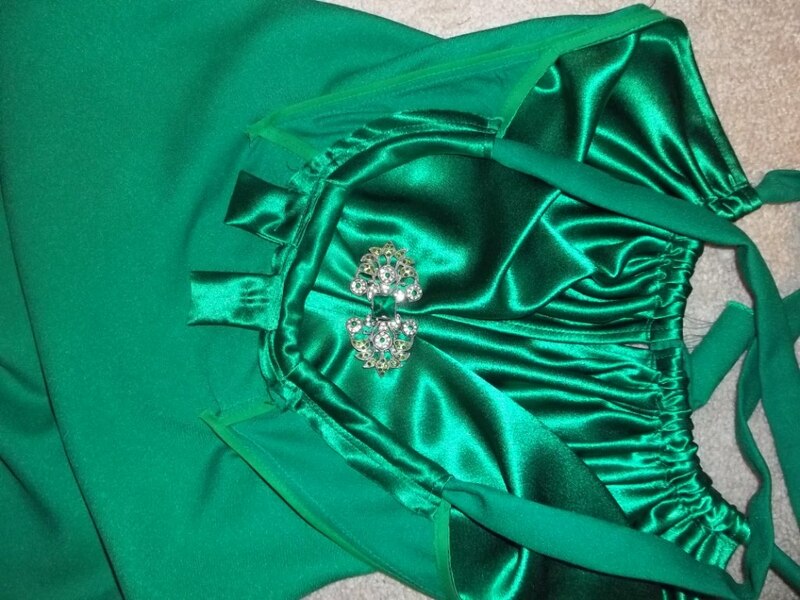 This emerald Vionnet gown has a taste of both contrasting styles. 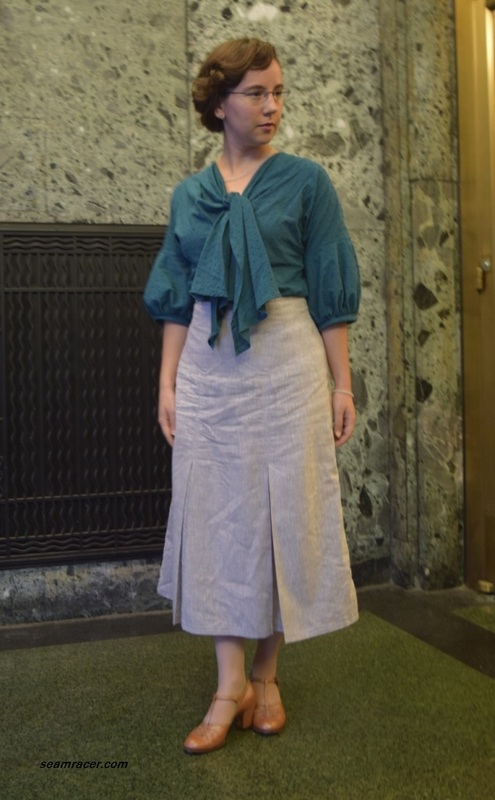 So, I’m slightly confused but still impressed that Vionnet’s design of this post’s featured dress is from the mid-1930’s, but it goes with the Depression era perfectly when women’s clothes were excessively extravagant and richly elegant – the opposite of the (then) current economic circumstances. Simple ornamentation is the ‘normal’ key to such clothes…the gown itself is amazing interest enough… but Vionnet’s gown calls for a unique closure to be a focus point! How daring, but it works. Another common feature to similar 30’s gowns are the extremely low backs and hemlines – achieving this with Vionnet’s evening gown was hard and a tad tricky. I’ll explain further down. The patterns in the book are small sized with no specifications as to what percent to grade up to for full size. I went through a copy store’s services to have them scan in, plot out, enlarge, and print my patterns since this was my first time making a pattern from this book. The only “bench mark” I went by to know how much to enlarge was for me to pick one spot on the garment for which I could say how long it should be, and figure the rest of the garment should follow grading up properly from there. 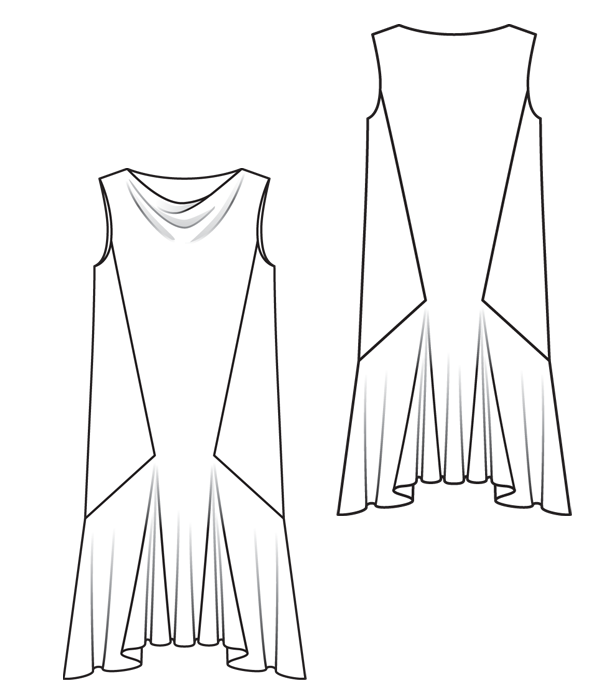 For instance, I realized for this pattern that the length of the front rectangles, from the top of the neckline to what should be the side waist, should be about the length of my collar bone to my waist (adding in some extra inches for error). This measurement was a define spot to realize how much to grade the book’s pattern up to…probably not the best way but wasn’t the worst either, just so as long as it worked. As far as I could tell the pattern is made for Japanese sizes 9 AR (US/Canadian sizes 8, U.K. size 10, and European size 38). This would make it for bust 34” (86 cm. 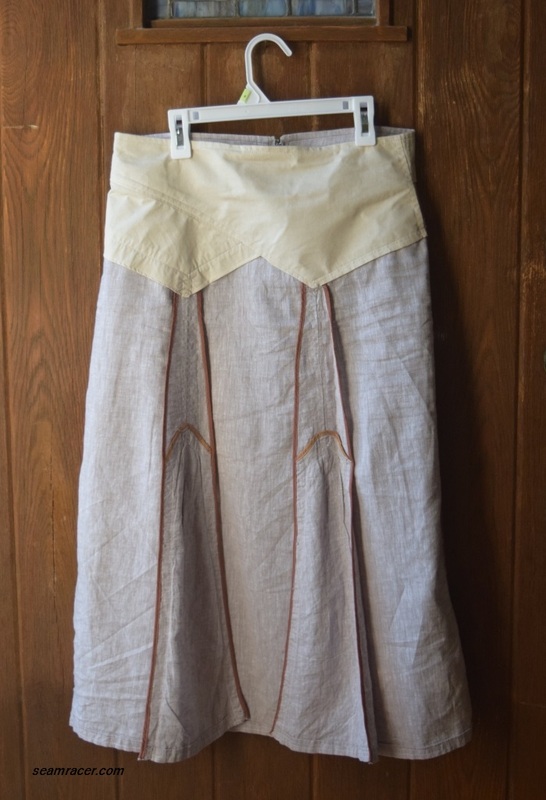 ), waist 26” (66 cm. ), hip 37 (94 cm.). I don’t remember where I read this but it seems accurate, maybe slightly smaller. I am very close to this size so I didn’t make any changes to the fit because bias cut is a bit forgiving. As it turned out, I could have made some small changes/adjustments to the fit, but this is just really the perfectionist in me wanting everything just right…a carbon copy of Vionnet. Part of me wishes I had made my gown just a tad longer so it sweeps the floor like a true 30’s gown, but that’s impractical for me so my dress is just below ankle length. Also the dip in the back where the ties make a “U” turn around the inserts could have been made a little wider for a sharper curve. My back curve to the dress is more like a “U” that got bent open and I think only the upper tops of the inserts could be lengthened for a look more like the original Vionnet dress. Pick, pick, pick – it’s what I do. 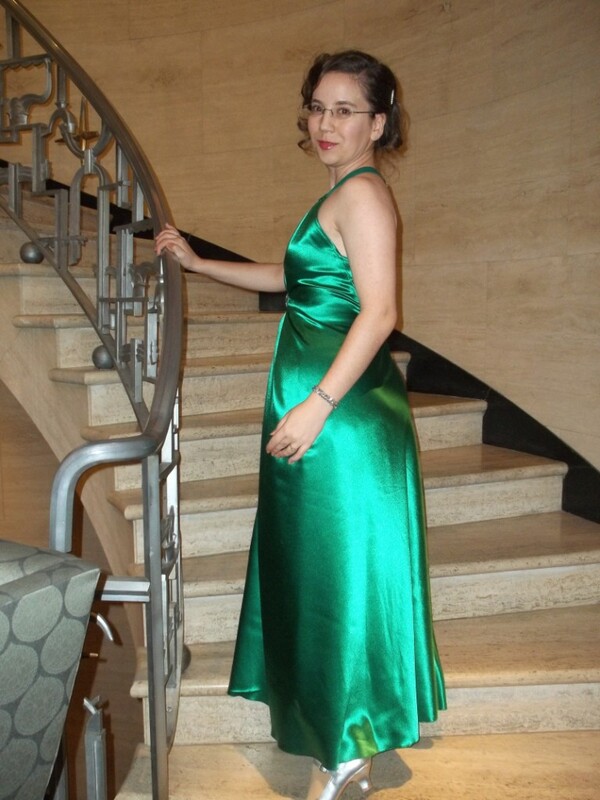 My dress is fine and the pattern is really easy…a tad hard to adjust. The pattern for this evening gown is awesomely simple and so awkwardly large. 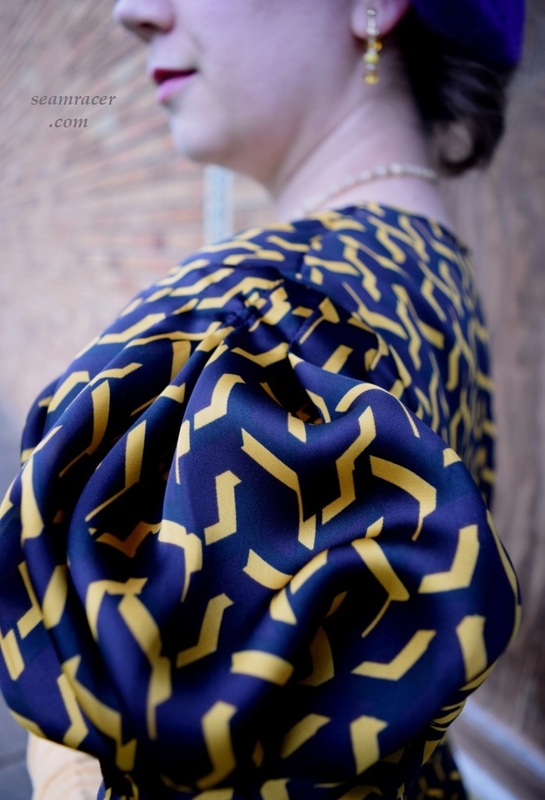 Except for the little parallelogram-shaped piece which completes the back dip, the dress is made of one huge shape. I really don’t know how someone who doesn’t have ample floor space or a gigantic table can cut this dress out. We have large open floor spaces at our home but even still it was maxed out to lay out 3 yards of 60 inch fabric in a single layer. This also had to be done when no one was around to walk in the house but me! As you can also see in my picture, I let the natural end of the fabric’s width dictate the seam where the dress would have a panel joined in to complete the dress. I did not follow the “joining line” on the pattern, as I wanted minimal seams (the dress seems to have been accommodating for the 35 inch or 45 inch fabric widths normal for those times). I believe the key to this dress being a success is 1.) the necessity of making the neck high and back low and 2.) the placement of the buckle. Firstly, the back dip needs to be low, low…like right at or above the waist because if not, the bias will not spread out over the bum properly. The neck needs to be high (close to the collarbone) for the back dip to be in the right place but also because it keeps the front in proportion, especially when it comes to adding the buckle which brings the dress in. 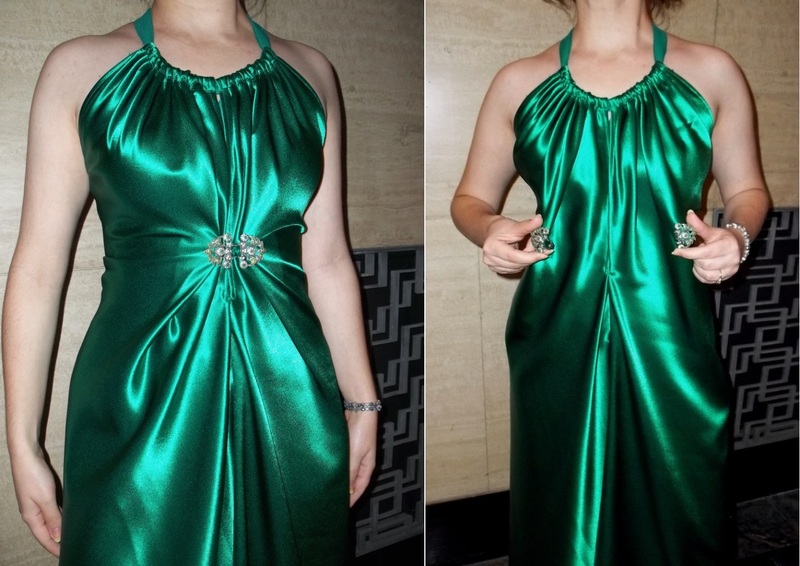 Thus, secondly, I found from looking at the original garment from Vionnet at the MET and experimenting with the placement on my own dress that the buckle has to be at a “sweet spot” on the body to reach the intended shape, drape, and look. There is a triangular space above your belly button that is between your ribcage just about big enough for the palm of my hand to cover. When the dress neckline comes to reach or go just under your collarbone (where it needs to hit), THIS SPOT between the ribcage and above the waist is where the buckle should go on the dress. Why am I so strong on this? I have seen plots of Vionnet’s garments where it proves how her clothes where designed with the composition of the natural lines of the body and its muscles in mind so it makes sense to me for her to pull the dress in at the same place where your body is “pulled in”…not where it pivots. Also, when the buckle is placed in that “sweet spot” the dress naturally flares out over both the bust and the waist/hips, creating the illusion of a small middle and at a more proper waistline, too. Conventional dressing knows nothing of the power of working with the body, and most people (including me) get so wrapped up in the only spots we focus on – waist, hips, bust, and maybe shoulders or other points, too. The comfort spot of “the waist” is different on everyone, but the buckle’s “sweet spot” is the same on everyone, and a very strong point in the body as it is…a good place to hang the dress. 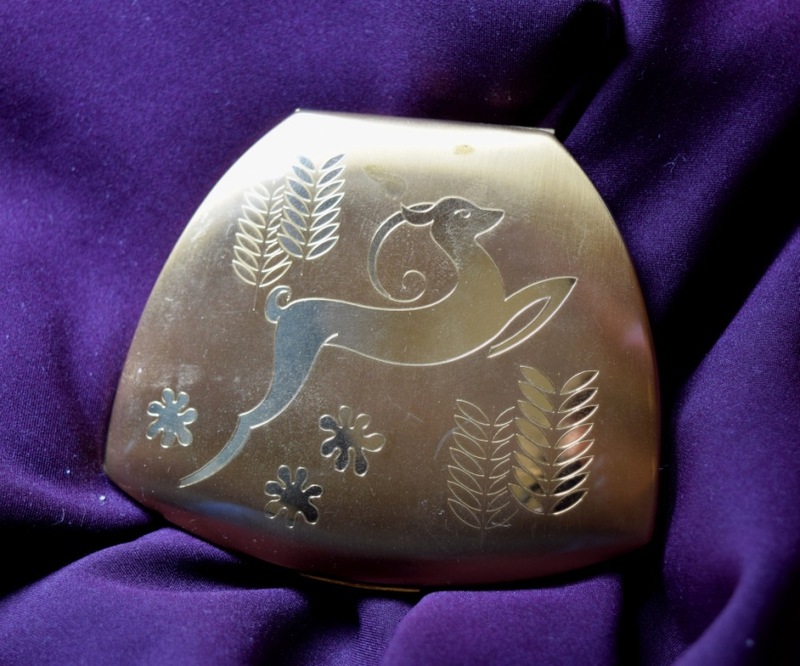 The ‘leaping gazelle across the pastoral scene’ on the original buckle is so beautiful and also very appropriately classic to the 1920’s and 1930’s. An image widely used on anything and everything to home and eating pieces to fashion (see my very own Elgin Compact, at right) and ornamental purposes, the leaping gazelle is an Art Deco carryover from the peaceful Art Nouveau era. The 1930’s ideal enjoyed reliving the Grecian past, through flowing, body-conscious dressing, and no one expressed this better than Vionnet, so the carved ivory buckle on the original gown could not be any more perfect. 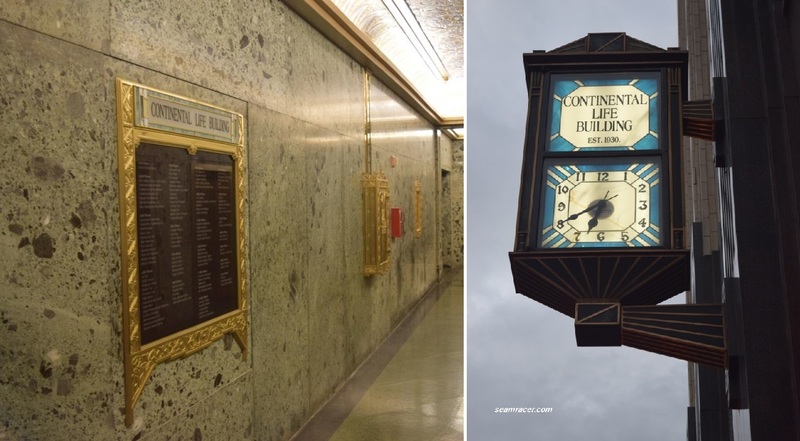 My own buckle, however, takes on the more uber-fancy and bling-loving side of the Art Deco era though it does have some swirling to the design. My buckle reminds me of costume jewelry with all its gems and details but it is some sort of fine metal (sterling silver, maybe) because it polished up nicely, even though the gems are probably fake. 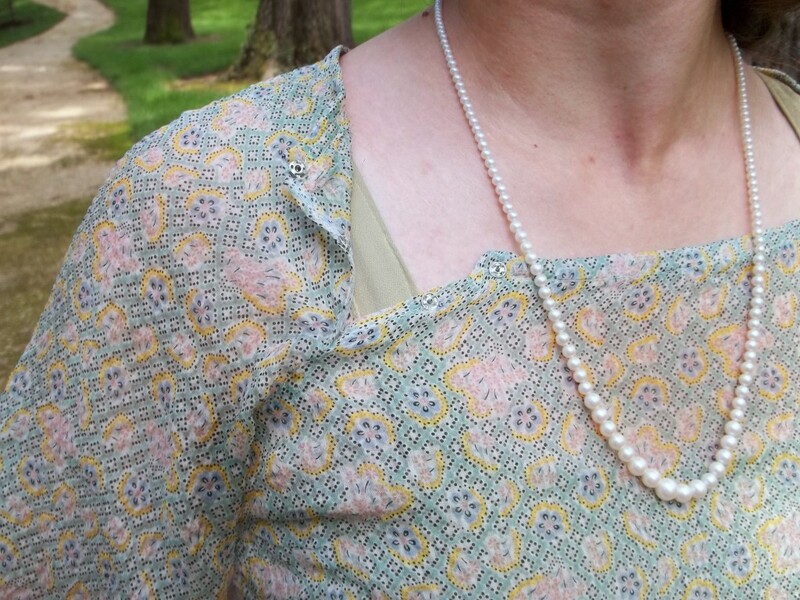 I also pinned another authentic vintage 1920’s or 1930’s pin to keep my back straps in place at the back of my neck. 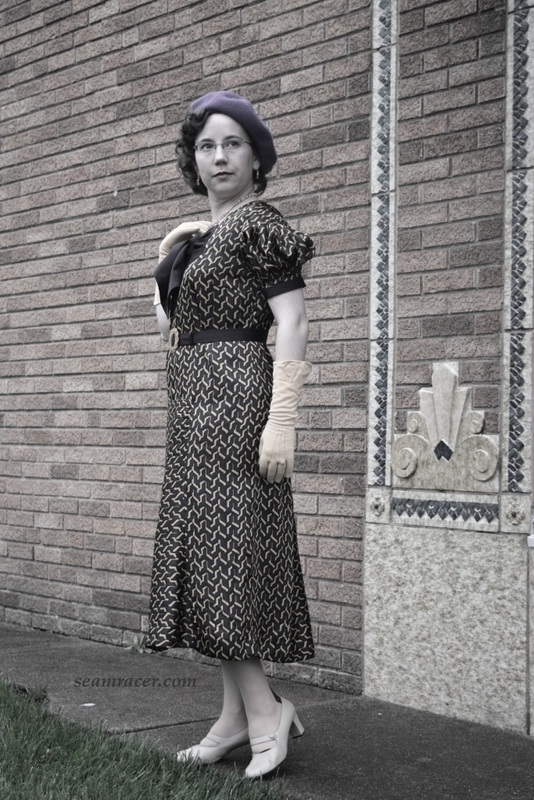 We went back to the proper time period and location where a dress like this would have been worn for our photo shoot location – the Chase Park Plaza. 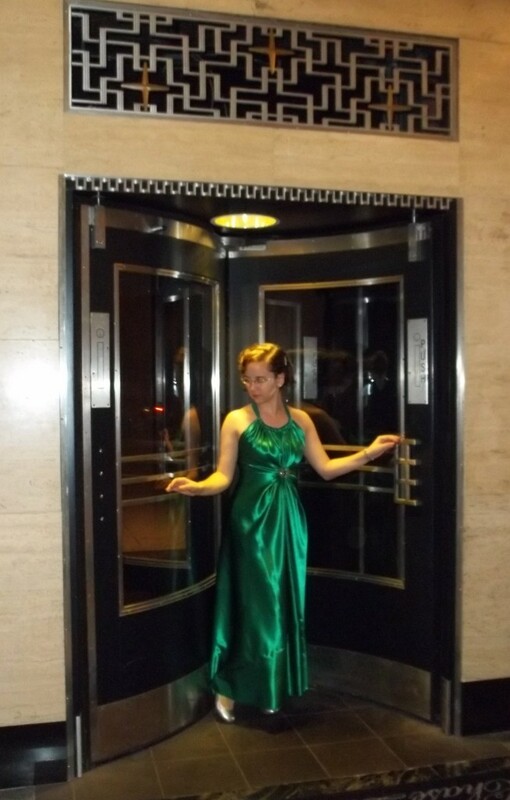 This hotel in downtown was newly completed in 1931 “as an opulent Art Deco masterpiece despite the Great Depression.” Many famous people have walked the Chase Park Plaza’s hallways and stayed under their roof, and with Art deco splendor around every corner need I say why I felt even snazzier modeling my fancy evening gown?! 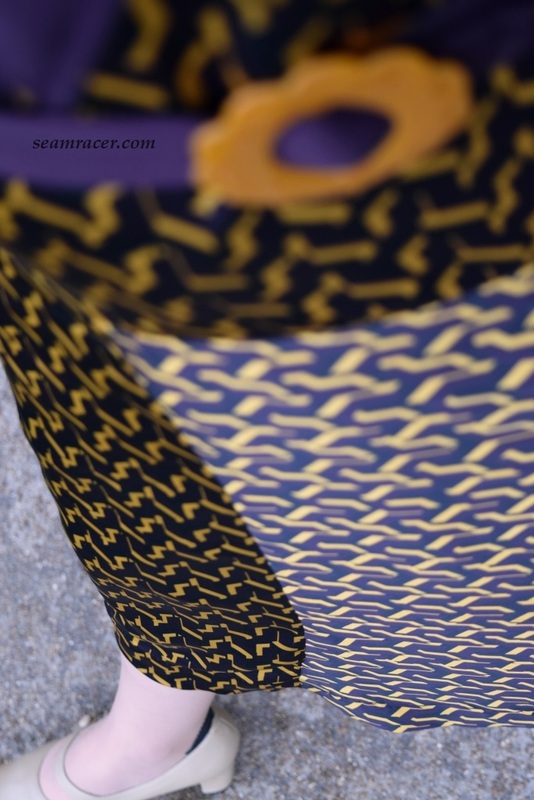 Something as commonplace as a vintage feed sack print gets an upscale upgrade when it came to planning and making my Easter outfit of the year 2014. 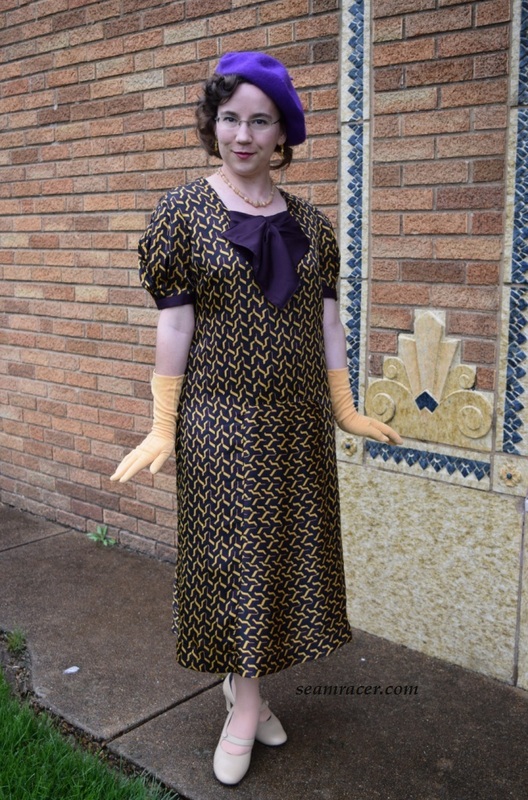 I had made a number of 30’s era garments earlier than my 2014 Easter outfit, but an authentic and all-out-beautiful classic of the mid-1930s (one of my favorite fashion era years) was in order sooner or later in my plans. 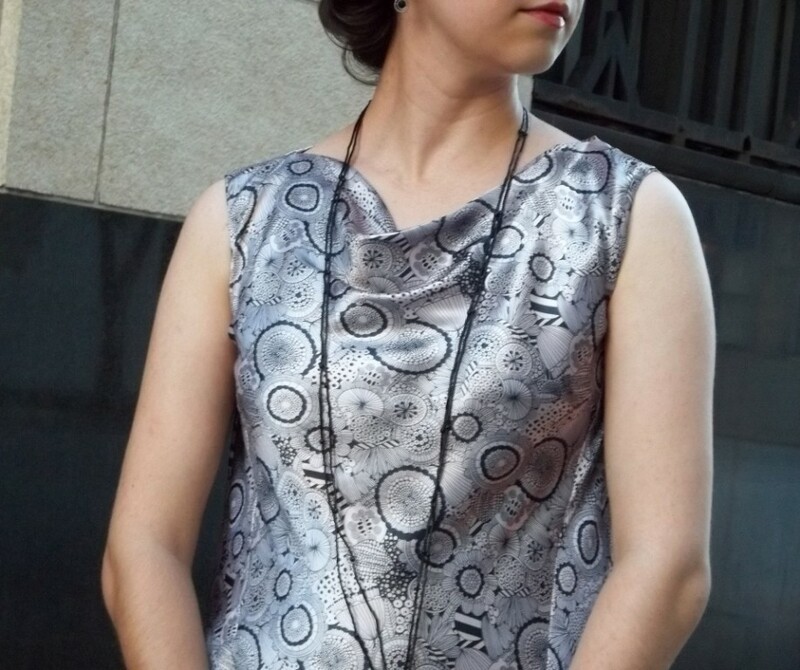 Here is my post about a sheer, flowing, silk chiffon afternoon tea dress with a under slip which has Art Deco lines. 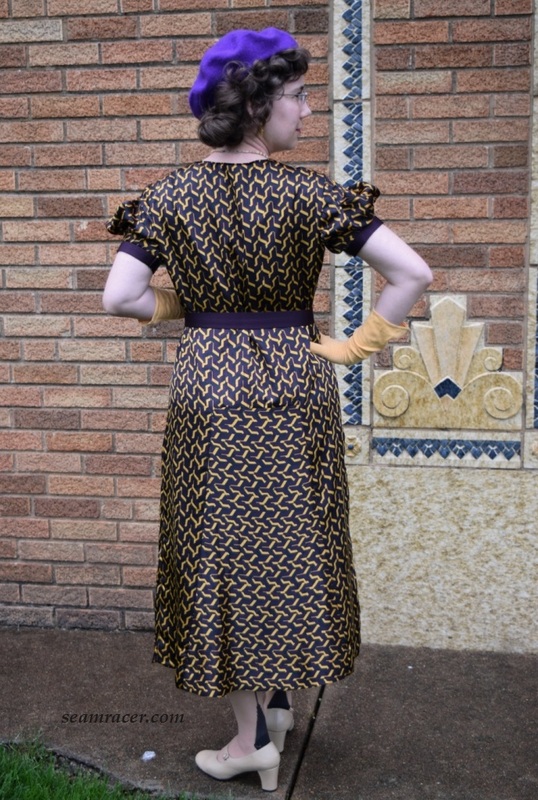 This 1930s silk set was quite time consuming to finish perfectly, but very fulfilling to make and even more lovely to wear. 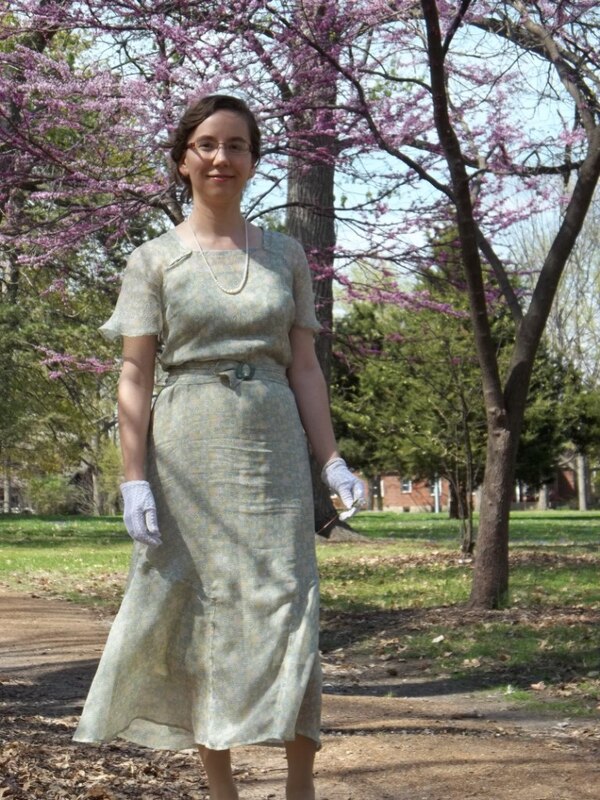 My Easter dress for the year before this one was a design from the 1920’s (my 1929 hankie-hem dress made in 2013; posted here). For 2014, I merely went up a decade to the 30’s, to have some continuity of progression through the upcoming years. FABRIC: The sheer feed sack printed over dress is an “Anna Sui Vintage Floral Silk Chiffon” (close-up at right) from Mood Fabrics. 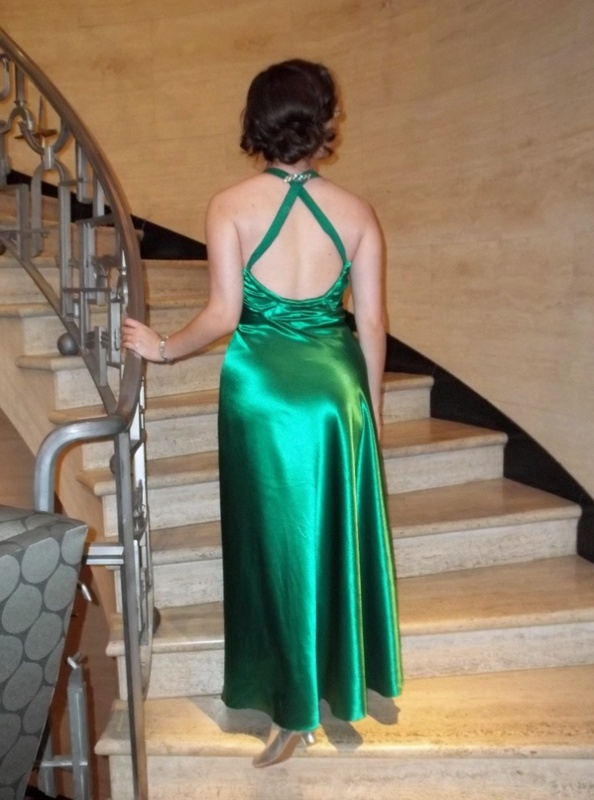 The under slip was made using a “Kiwi Color Solid Silk Chiffon”, also ordered from Mood. NOTIONS: I bought most of the notions that went into making my 1930’s Easter set. I had to buy several spools of thread, a package of stay tape, the buttons, and a skein of embroidery floss. I did have on hand the few snaps which were required. 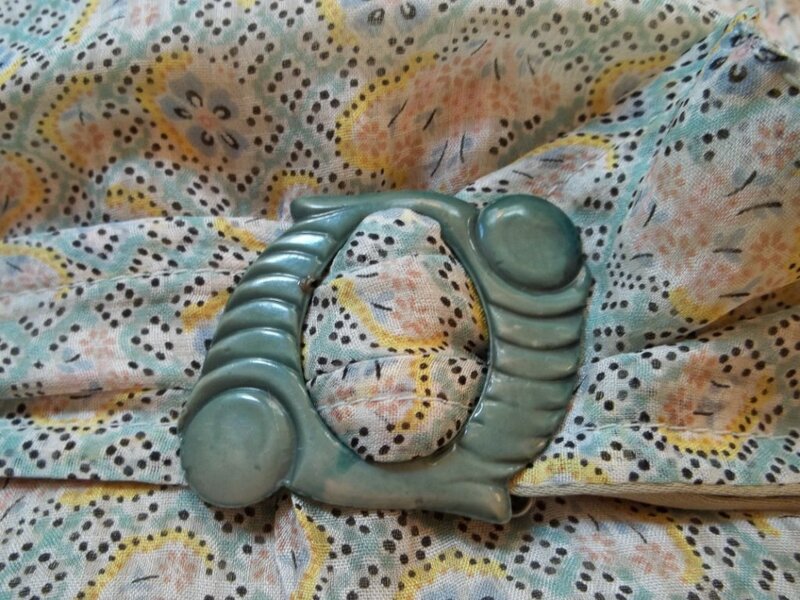 The belt buckle is a very old Art deco piece that I also had on hand, bought a while back from a vintage shop. 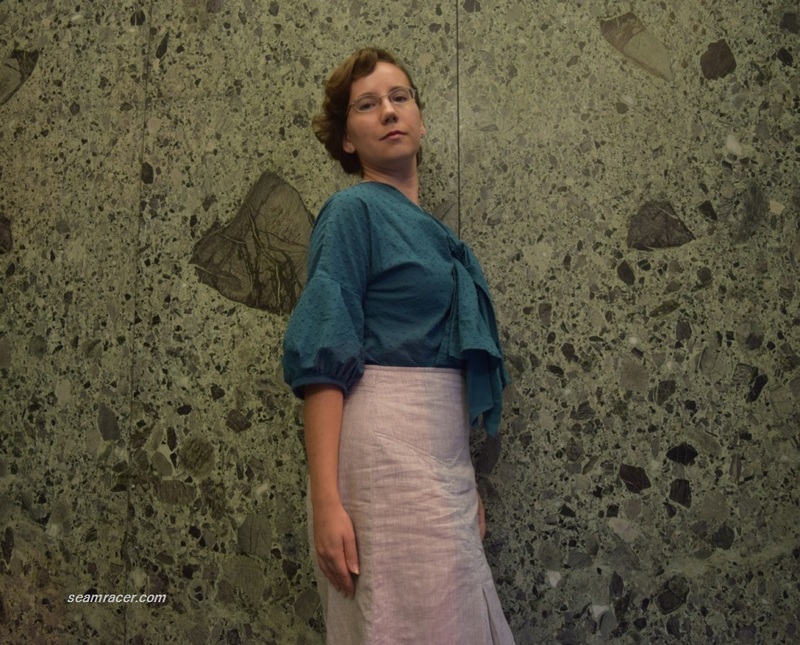 PATTERN: My outer dress is a pattern from Past Patterns, #2303, “Summer Party Dress: Circa 1935”. The under slip pattern comes from the book “Vintage Lingerie” by Jill Salen, pages 46 to 49, the “1930’s Silk Slip”. TIME TO COMPLETE: The outer sheer dress came together quite quickly considering, about 20 hours stretched out over 4 or 5 days. It would have been even less if I hadn’t caused more work for myself when it came to the sleeves (I’ll explain this down lower). The slip took…oh, my, very much time! It took long enough to get the slip wearable with the dress in time for Easter (April 20th), but much longer to do the final fitting, seam finishes, and embroidery details. I worked on the fine finishing details on and off for the next few months until it was finally done in August of 2014 (for a total of maybe 30 hours). THE INSIDES: All the inside seams for the sheer over dress are done in French seams, except for the bottom skirt flounce inserts, which were lapped on, and the skinny ¼ inch hems. 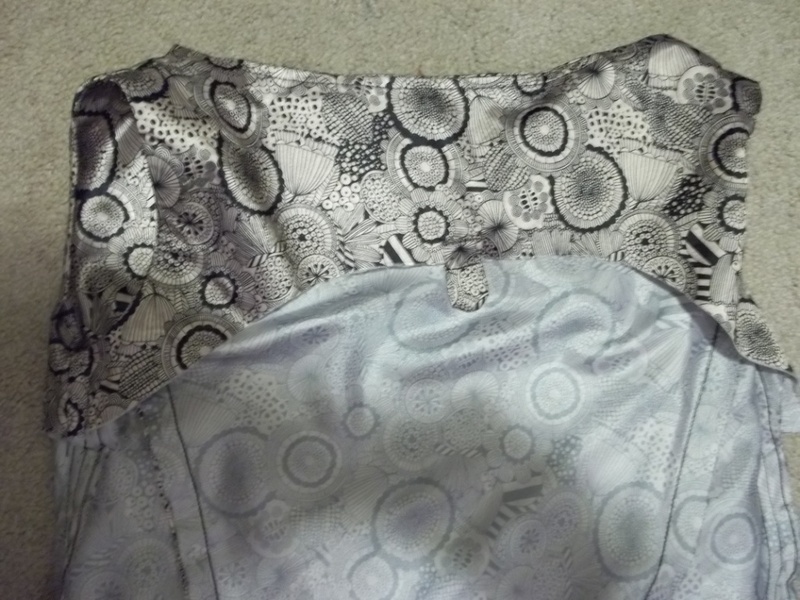 My under slip had the bodice panels lapped on, similar to a flat felled seam. All the other seams to the slip were made in clean finished seams covered with a strip of stay tape for sturdiness (see left picture). TOTAL COST: I ordered 3 yards of the Anna Sui Feed Sack Silk Chiffon, at a sum of $38.40. 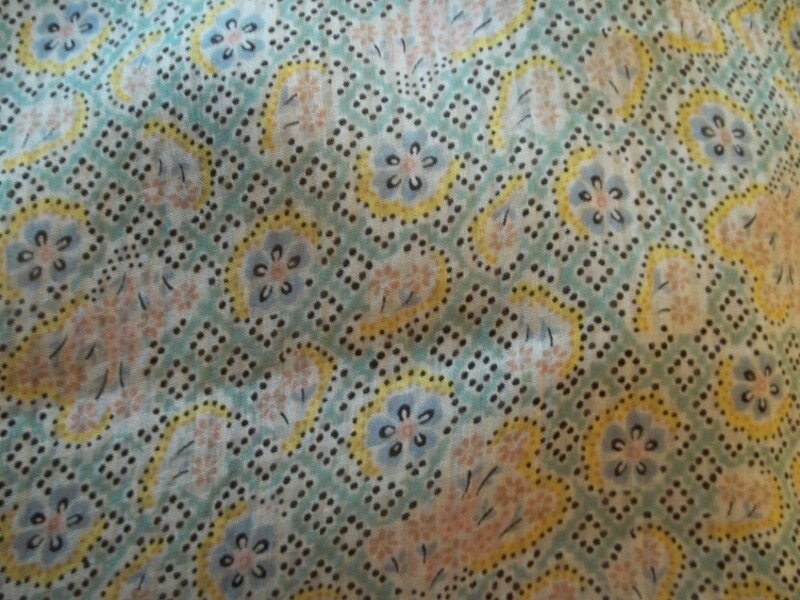 Now the Kiwi Solid Chiffon was $39 for my cut yardage of 3 ½ yards, but I only used a yard and a half for the slip ($19.50). 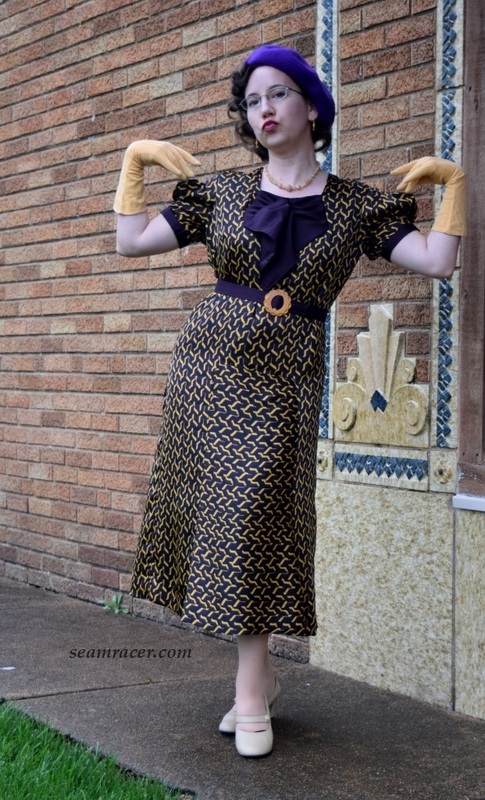 My total cost for the outfit fabric comes to $58, but…I didn’t have to pay for it! It was free as part of $100 gift credit, my prize for winning the “Butterick to the Big Screen Contest” in June of 2013. All I really paid for then was the notions, which might have been $10 or less! Score! This was my very first time sewing with silk this fine and expensive. Boy, was I intimidated! I was so afraid of messing things up or having something in some way going wrong. But I knew I just needed to dive in and start learning and progressing. I did use my hubby’s Grandmother’s old Brother sewing machine because it has a smooth run, predictable stitches (besides, my favorite tried and true work horse machine was needing repair). I also started out with brand new “sharps” needles, and replaced one or two more needles on my machine throughout the outfit’s construction to eliminate any possibility of getting runs in the silk chiffon. Besides these basic steps, and just plain old being careful, thinking clearly, and taking my time, sewing with these silk was a truly a wonderful dream. 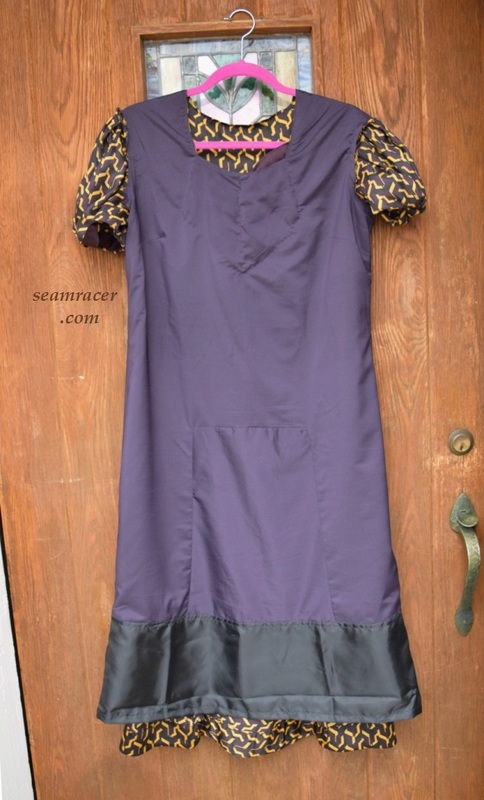 I am still amazed at how easy the Anna Sui silk chiffon was to sew…much, much easier than polyester chiffon, with less runs and fraying than a poly imitation, too. Now I did find the thicker solid Kiwi Chiffon to be a bit more of a problem, but I think maybe it was just because I “wrestled” with making the slip work for so long, I may have a bit of prejudice towards it. 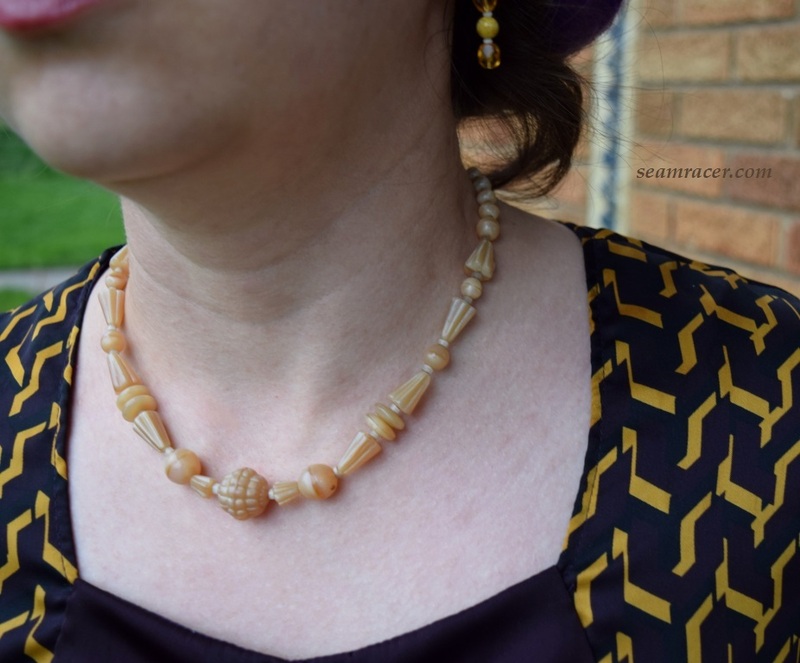 At first, I also experimented with some scraps to do the method recommended on a few tutorials and blogs – keeping a layer of wax paper between the feed dogs and the chiffon. It was not working for me nor worth the trouble. All I did was stitch slowly and evenly, feeling out the bias of the fabric and being extremely careful to not stretch it in the least. Using stay tape really helped add some body and help the feed dogs grip the fabric better, as well as stabilizing the seams for wearing. Stay tape was even sewn into every dart, and on top of the slip seams, because I didn’t want to rip or tear anything from the movement of wearing the dress. Look carefully in the picture at left of the dress’ insides and you can see the stay tape netting strips. This was the best idea for my dress – the stay tape holds and helps all the seams, does not itch against the skin, and is just as perfectly soft and flowing as the silk. Thank you to the wonderful employee at my Hancock Fabric store for giving me the idea. The Past Pattern for the over dress seemed to be close to my size, just a tad larger all over than what I needed. 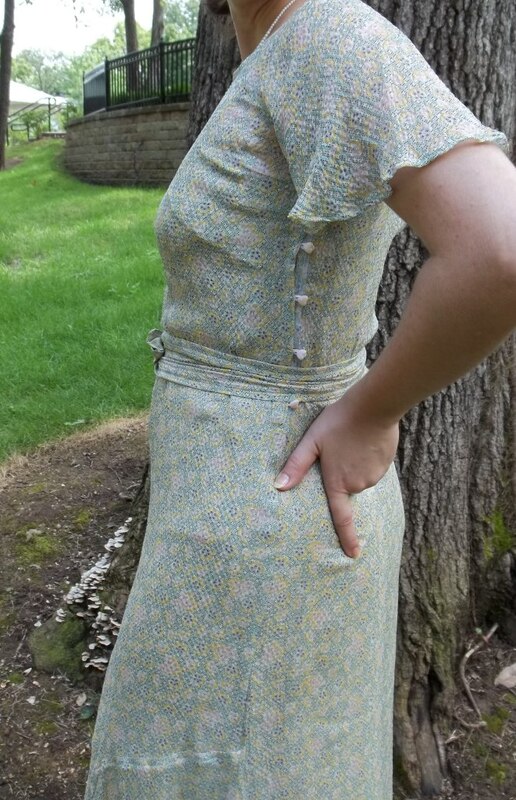 Knowing that, from my experience, many 1930’s patterns run small, I cut it out as is and it turned out just perfect. The one single change I made to the construction was to make single darts on each right and left side (a total of two) for the waist back instead of making them in pairs on each side (for a total of four) as the pattern instructs. Everything else for the pattern was made unaltered. Believe it or not, there are only 4 easy pieces to make the afternoon dress. All the pieces fit and matched together perfectly. The sleeves and the skirt flounce inserts are cut on the bias and all other pieces (the front and back dress panels) are cut on straight grain. As you can see, I did choose the square neck option (over the V-neck). I love the gentle fit of the tiny double bust darts on each side of the front panel. What the pattern calls “cape sleeves” also have a tiny dart along the top of the shoulder coming from the neckline for a small touch of added shaping. 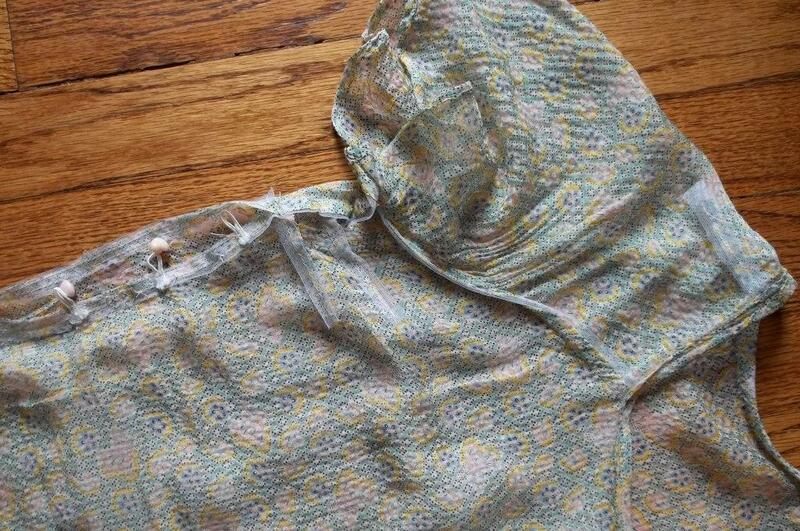 There is a small opening a few inches in for a snap closure at the right neckline of the raglan seam of the sleeve, so the dress goes over the head easily. 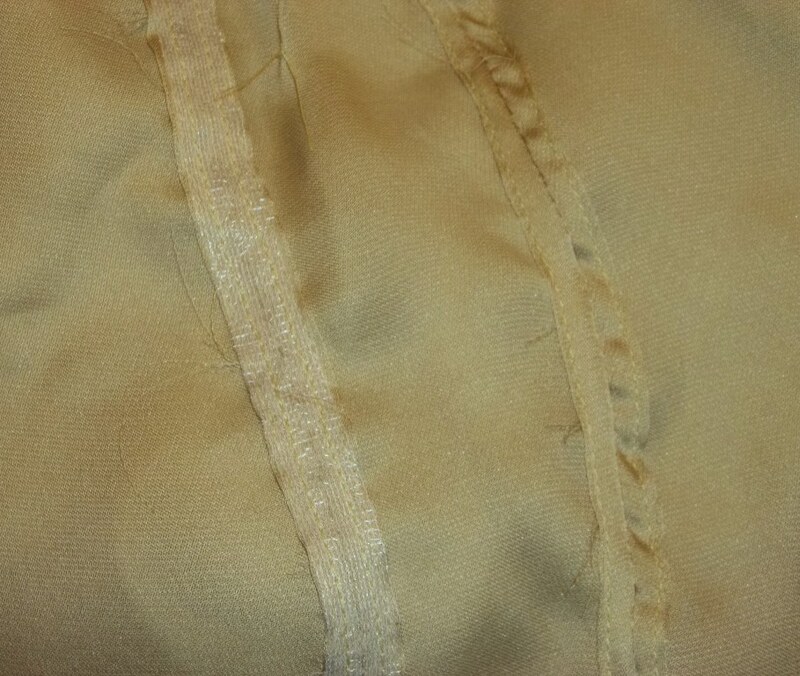 I decided to add the sleeve hem ruffles, and it took several hours to do their hemming, gathering, and stitching down. After, the ruffles were on, I just could not like them. So…off they came after some serious time spent unpicking. My hubby generously did a good amount of the unpicking while I worked on the waist belt. I did end up having the trim a bit off the edge of the sleeves after the ruffles were out, just because the silk is too fine to not get affected by sewing and unpicking, so they are a tad shorter than intended. The belt came out wonderfully, but I wish it was a little longer. 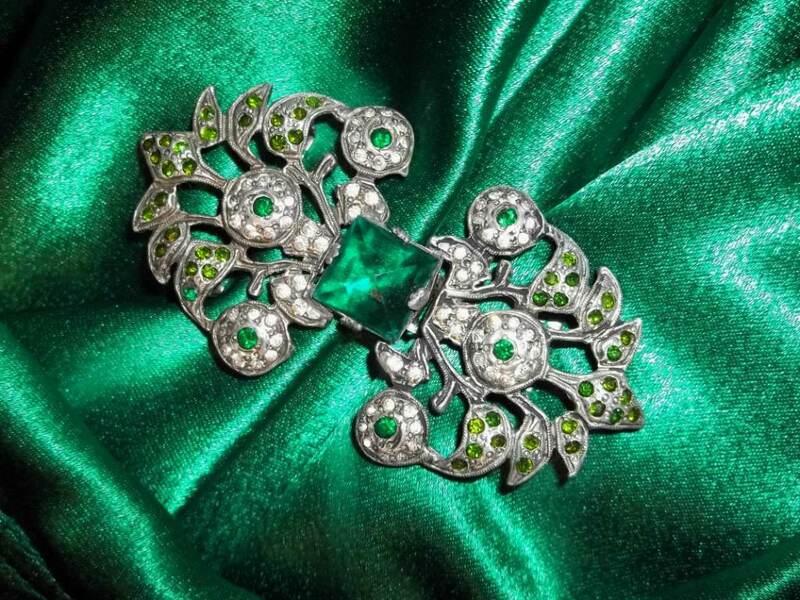 It was supposed to be my size but only hangs out a handful of inches past my old amazing Art Deco buckle. Oh well – as long as it makes it around my waist. 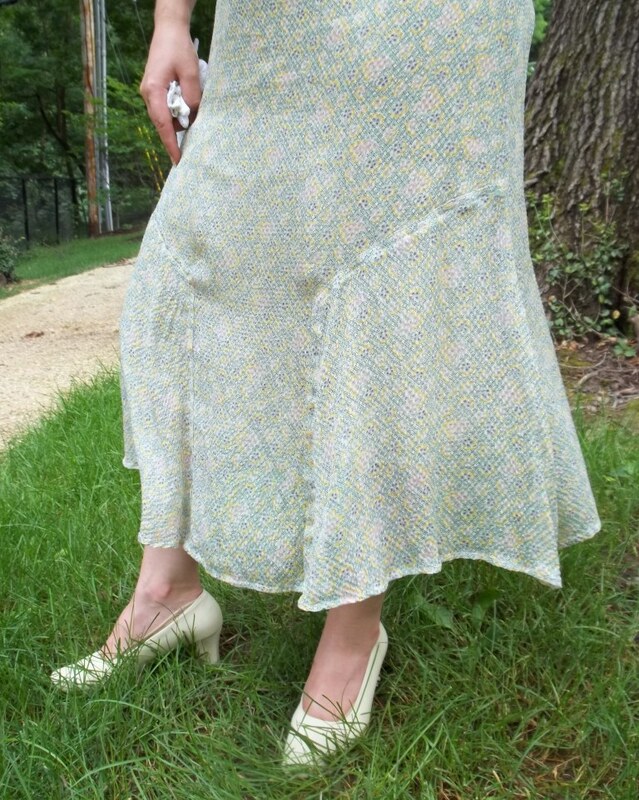 The belt is lined in the same fabric as the under slip, making the belt pretty much reversible and similar in color tone as the rest of the dress. The side closure is a simple button and loop style. 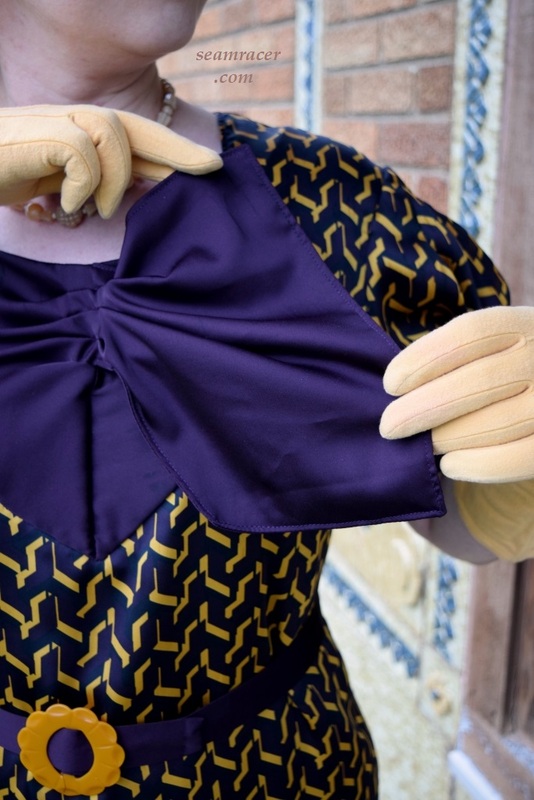 I used the same “President braid” trim leftover from making my scalloped collar “The Artist” movie dress for the loops, and sandwiched them under some more stay tape for support along the one opening edge. On the other side of the side closure edge are tiny light pink heart shaped buttons to go with the feminine theme and pastel colors of my dress set. My under slip pattern, coming from the book, had to be enlarged 200% in order to become full sized and usable. I had a local print shop do this step for me instead of my doing the re-grading by hand and ruler. I did my best at measuring the proportions of the slip to find out what size it might be. The patterns from the book were not made from other patterns, but from old vintage pieces themselves (I suppose whatever the author had access to or owned herself) so each piece in the book is a random mysterious size. 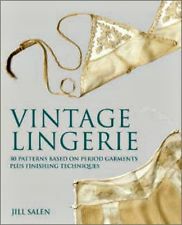 Every time I use a pattern from this book “Vintage Lingerie”, it’s like taking a gamble. From what I could tell, the slip would be close to my size, so I added on seam allowances (5/8 inch) and cut it out as is. 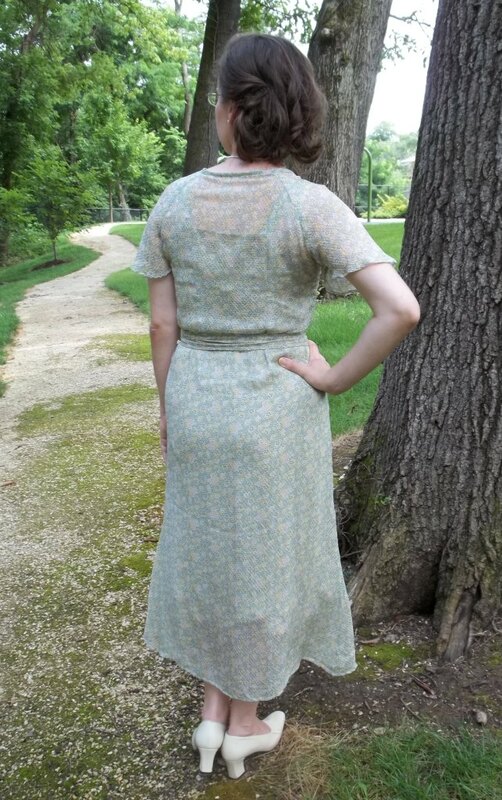 The entire slip is apparently and early 30’s design and meant to be worn under a bias dress, that is why it has such long lines and all straight grain pieces. The only bias to the slip is on the curved shaped edge of the upper bodice panels. My little dachshund is that dark thing on the floor at my feet! Once it was finished, the slip was tried on and, yes it did fit but – wow – it was tight! My hips are about 35”, with my waist about 8 inches smaller than that, so I’m assuming this slip would comfortably fit someone smaller than me. 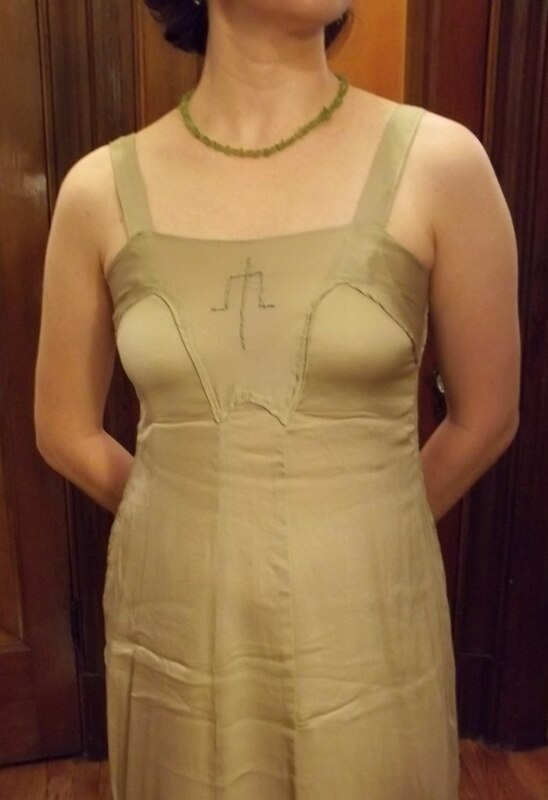 My closest size estimate is that, unaltered, this 30’s slip is for a size 30” – 32” bust, 25” waist, and 33” hips. I was hoping to make the slip go on and off without needing a side closure so I needed to make extra room somehow. 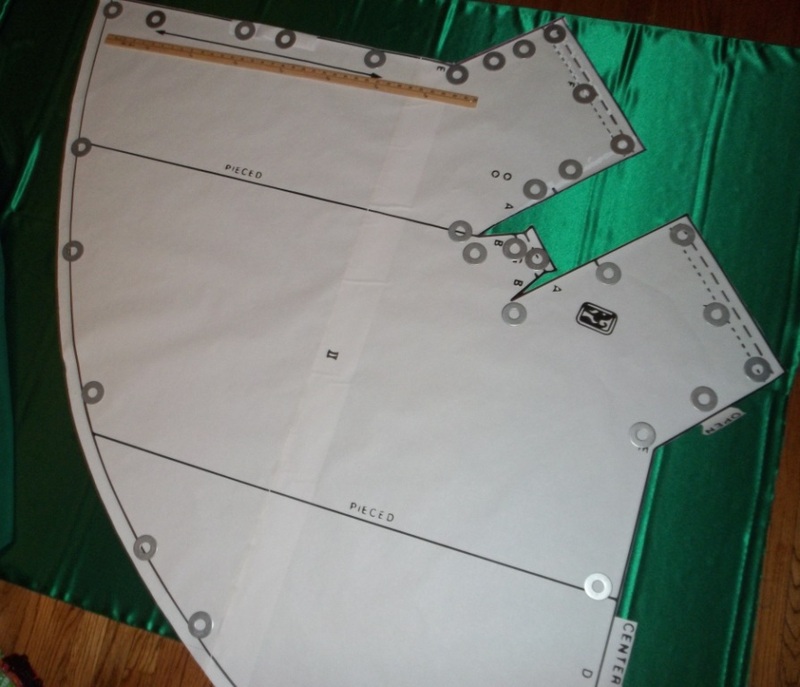 After some brainstorming with hubby, we came up with the idea of cutting out another two center front panel pieces from the slip pattern and adding it into the side seams. The center front panel is skinny with a slightly wider taper at hem end giving just the little bit of extra room I needed much like a godet. Adding in the side panels did add more seams for me to finish off, but so it had to be. I do wish the slip was a bit longer on me, and I think I’ll write a note to adjust the pattern, but I‘ve done enough work on it so I can’t complain. 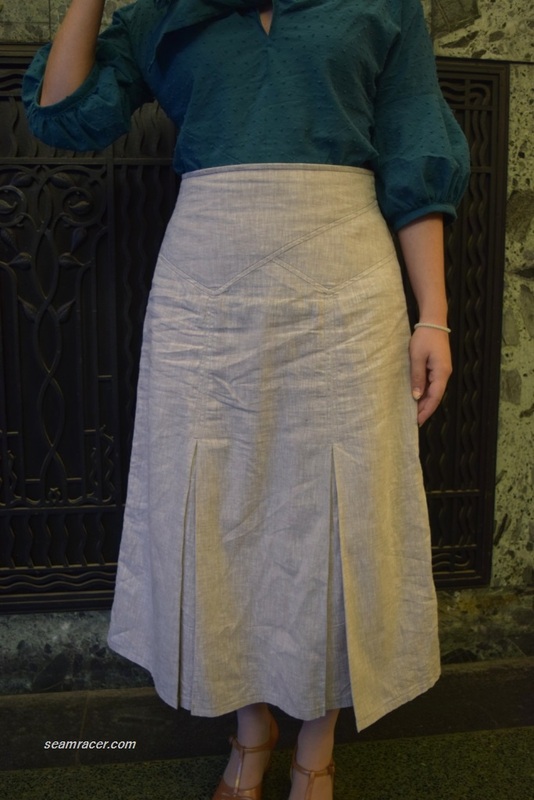 In our pictures of me wearing just the slip, it actually fits tighter than originally when it was newly finished. This is because I didn’t wash the silk first before I assembled and wore it for Easter. It was washed later and now has a snug and complimentary body forming fit, but this was not intended. From the feel it, I am supposing the silk might act similarly to denim blue jeans: the fit is tighter once newly dried and out of the wash, loosens up again as I wear it, until the next time it gets cleaned when it shrinks up again. 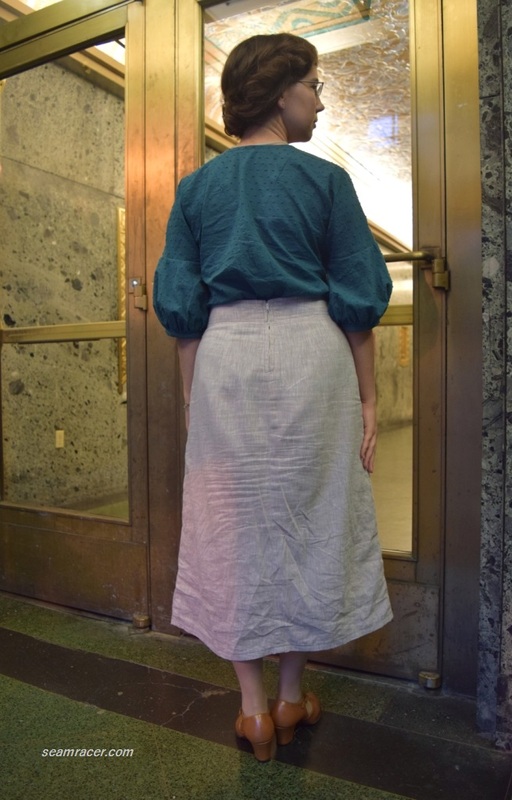 On the opposite side of things, the outer sheer overdress was not washed before the pictures were taken and it didn’t shrink much at all from washing it. The chiffon did change its finish, though, going from smooth and flat to looking like a seersucker after it was washed. The seersucker look is not a bad thing to have, and I like it enough to not iron it out…it was just unexpected. I normally wash every fabric before using, but now I know to make no exceptions (not even for silk, wool or linen) if I don’t want surprises. The original blue slip shown in the book had more fine details, such as fagoting, drawn threads, and eyelet embroidery, than my own version. Making the slip was hard enough the way it was. However, I’m not really complaining, just happy the extra effort I put in comes to such a unique and special finished garment, even if (besides counting myself) it only gets seen on my blog! I don’t know if the front panel detailing was meant to be a monogram, and I was tempted to design my own, but it had a nice Art Deco design to it so I hand-stitched it exactly as the original in the book. Afternoon Tea dresses have a style and beauty all their own. 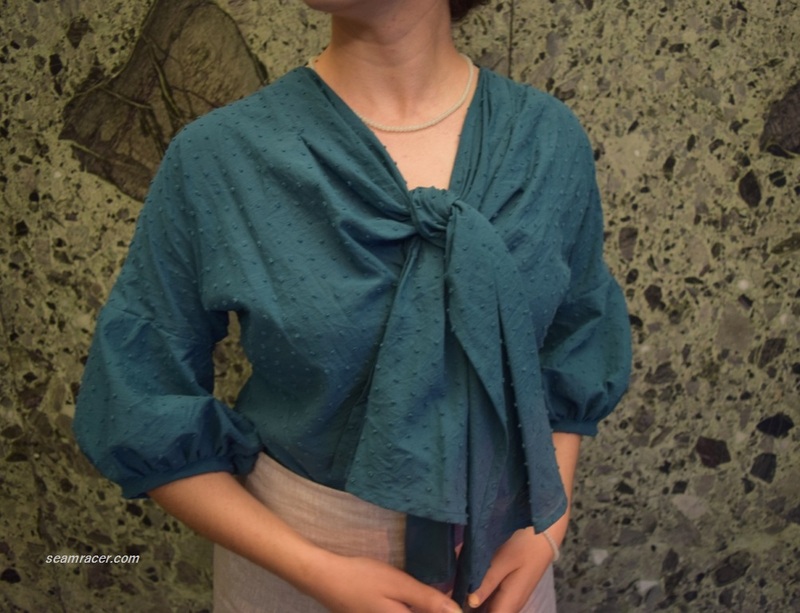 Soft flowing fabrics created a free-flowing, feminine, and comfortable garment – for summer it would be rayon, sheer cotton, and silk (if you had money in the 30’s), and for winter, wool crepes, rayon, and satins be in order. 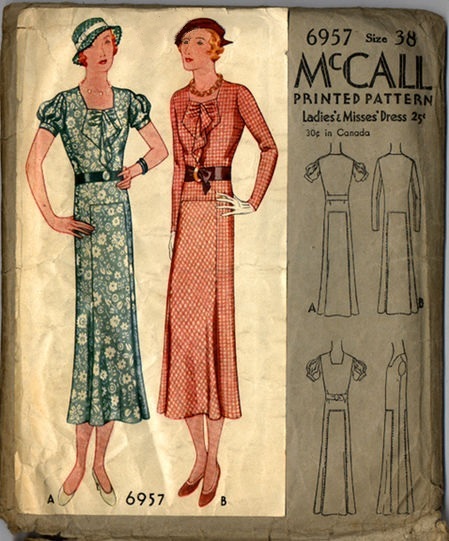 The swinging silhouette of mid 30’s afternoon dresses was achieved with flared bias panels and simplicity in design, like my own dress set, compared to day dresses which often had pleats and details like embellishments. Day dresses’ necklines had a utilitarian style, such as collars or front zippers and buttons, while afternoon dresses had simple, beautifully shaped necklines. Day or afternoon dresses were both quite decent as far as covering, but the “day” style was more utilitarian (for shopping or working at a job) while the “afternoon” style was for out of the home leisure, eating out, and other nice occasions. (Info from here.) 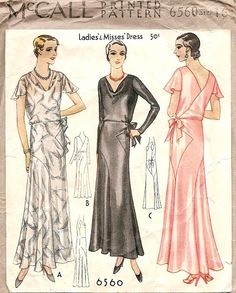 A slim and sleek silhouette with wide but softly shaped shoulders is period appropriate for the decade of my dress with a belt necessary to define the waist, since the early 30’s drop waist look (of the 20’s) was definitely gone by 1935. 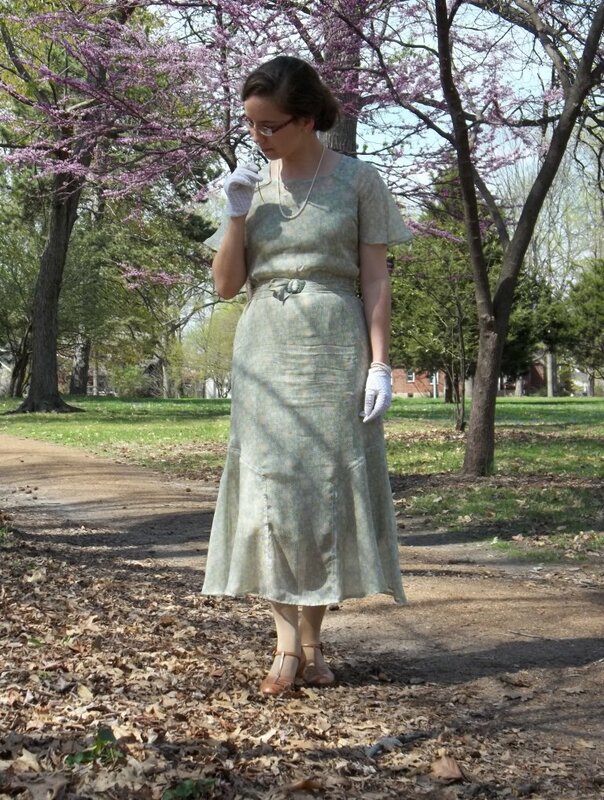 My Easter dress set is indeed the perfect “tea” length which is mid-shin, iconic of the 1930’s…an odd length really, but quite complimentary once worn (so I think). Afternoon dresses came from a time when there was a garment for different times of the day and occasions of life – day wear, afternoon “tea” outfits, house dresses, evening elegance, leisure gowns, negligée sets and nightwear. 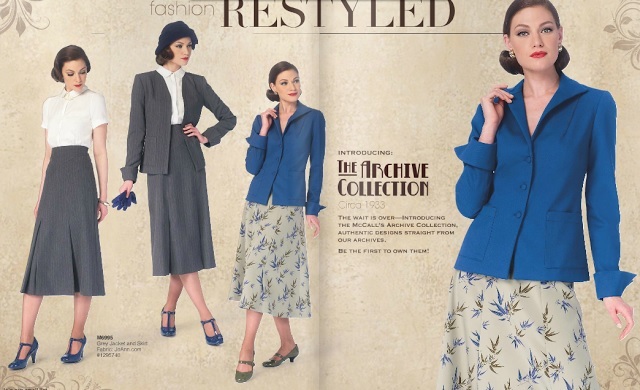 This did not last much longer past the 1940’s, but it sure provides an interesting variety of styles and garments to suit any person’s taste, body type, and need. 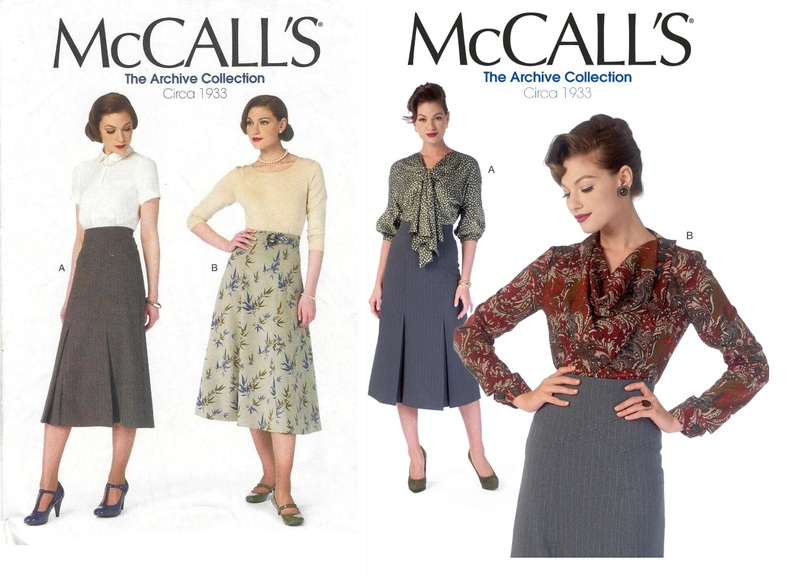 History provides such a variety of vintage fashions. This variety enables “vintage” to be easily re-made (whether from a pattern – reprints and originals – or an old original piece) and worn in our modern times than many people realize. Try something new, and you might just find a new favorite!